Angel in the Sickroom: My Computer Almost Gave Me a Heart Attack! God! I was this close to smashing my computer to smithereens! I came home from work and I was exhausted. Playing Oblivion IV was my way of de-stressing my self so I turn on the computer. It was very strange when it said "Preparing My Desktop" but I didn't think anything was wrong until I realized that my computer somehow lost it's memory. My files where gone and my settings where different. It was ok at first because my Oblivion game was still there but when I started to play I was horrified to discover that my saved game files where also deleted or where missing! I was about to lose my mind when I realized that maybe if I restarted it it might fix itself or something. And thank goodness it did just that. 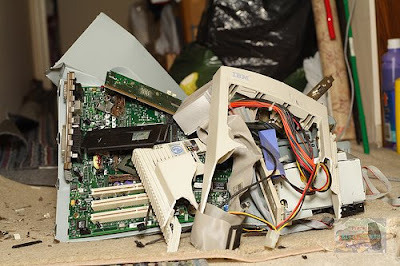 So my computer is safe for now from being turned into scrap metal. So be good computer! You don't want to be hurt!